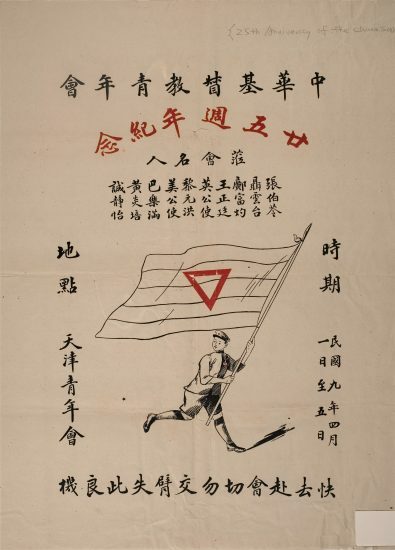 This is a poster for the 25th Anniversary of the Chinese YMCA, Tianjin (Tientsin), April 1-5, 1920. The two-color poster has Chinese text and an image of a boy who is dressed in a uniform and is running and carrying a YMCA flag. The poster encourages youth to hurry up and not to miss this opportunity. Bottom: Hurry to the conference. Do not miss this opportunity.